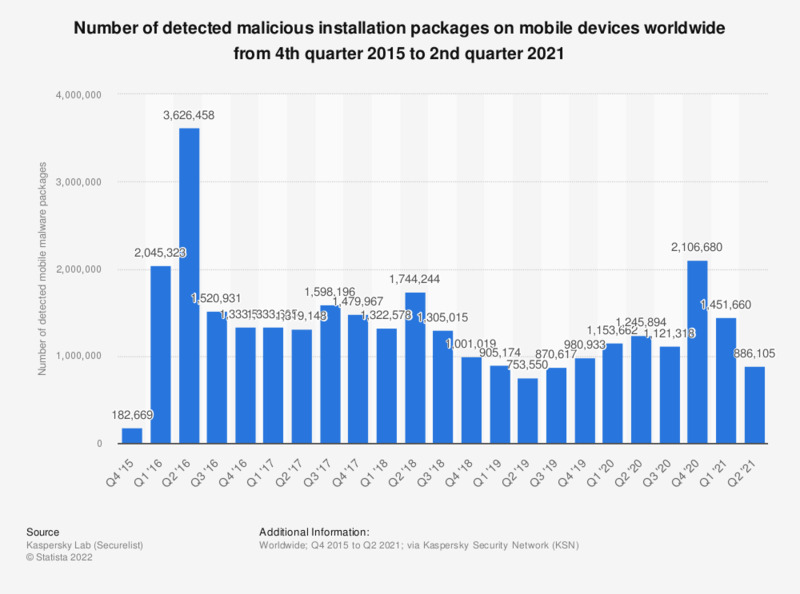 This statistic presents the number of detected malicious installation packages on mobile devices worldwide from the fourth quarter of 2015 to the third quarter of 2018. During the most recently measured period, the source detected close to 1.3 million mobile malware installation packages. Everything On "Security software" in One Document: Edited and Divided into Handy Chapters. Including Detailed References. Which IT security tasks are you facing the most pressure to address? Why are you not concerned about the UK security services' ability to track and control smartphones? What initiatives has your organization launched to address mobile security risk? What concerns you most about secret services' having the ability to track and control smartphones? Why do you not feel your smartphone is secure? Approximately, how many hours was spent to deal with and contain your most recent ransomware incident? What kind of information security software do you have on your home computer? How concerned are you about cyber security threats to your company's networks and electronic data?